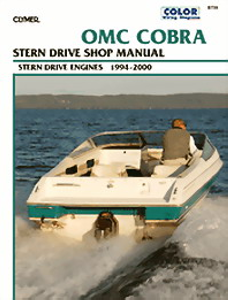 You are on page 1 of 5 pages for your selected item: "Repair Manual"
OMC Cobra Stern Drives, 1986-1993. Clymer marine manuals provide comprehensive, detailed service information for all repairs. The step by step text is geared to do-it-yourself owners as well as expert mechanics. Hundreds of photos, drawings, and tables, including complete wiring diagrams. 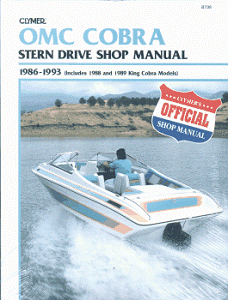 OMC SX Stern Drives, 1994-2000. Clymer marine manuals provide comprehensive, detailed service information for all repairs. The step by step text is geared to do-it-yourself owners as well as expert mechanics. Hundreds of photos, drawings, and tables, including complete wiring diagrams. 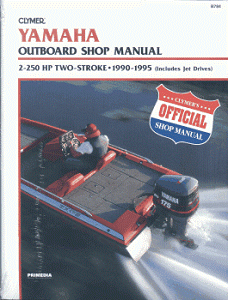 Yamaha 2-250 HP Two-Stroke Outboards and Jet Drives, 1990-1995. Clymer marine manuals provide comprehensive, detailed service information for all repairs. The step by step text is geared to do-it-yourself owners as well as expert mechanics. Hundreds of photos, drawings, and tables, including complete wiring diagrams. Yamaha 75-225 HP Four-Stroke Outboards, 2000-2003. Clymer marine manuals provide comprehensive, detailed service information for all repairs. The step by step text is geared to do-it-yourself owners as well as expert mechanics. Hundreds of photos, drawings, and tables, including complete wiring diagrams. 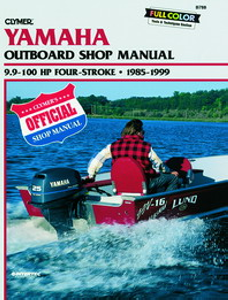 Yamaha 9.9-100 HP Four-Stroke Outboards, 1985-1999. Clymer marine manuals provide comprehensive, detailed service information for all repairs. The step by step text is geared to do-it-yourself owners as well as expert mechanics. Hundreds of photos, drawings, and tables, including complete wiring diagrams. 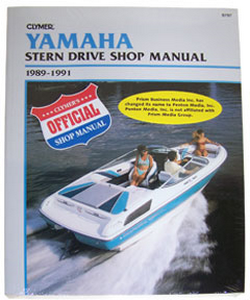 Yamaha Stern Drives, 1989-1991. Clymer marine manuals provide comprehensive, detailed service information for all repairs. The step by step text is geared to do-it-yourself owners as well as expert mechanics. Hundreds of photos, drawings, and tables, including complete wiring diagrams. 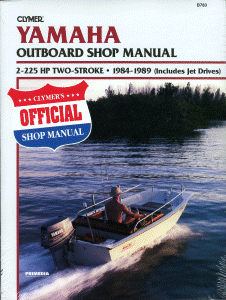 Yamaha 2-225 HP Two-Stroke Outboards and Jet Drives, 1984-1989. Clymer marine manuals provide comprehensive, detailed service information for all repairs. The step by step text is geared to do-it-yourself owners as well as expert mechanics. Hundreds of photos, drawings, and tables, including complete wiring diagrams. MerCruiser Alpha One, Bravo One, Two and Bravo Three Stern Drives, 1995-1997. Clymer marine manuals provide comprehensive, detailed service information for all repairs. The step by step text is geared to do-it-yourself owners as well as expert mechanics. Hundreds of photos, drawings, and tables, including complete wiring diagrams.